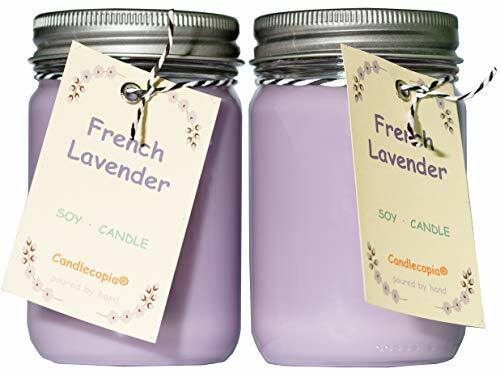 We think you'll really like French Lavender - The unique aroma of French lavender flowers. All Candlecopia products are made with care in the U.S.A by folks like you, who really like candles and who care about the environment. Our products will fully melt and will abundantly throw fragrance for many, many hours. Candlecopia is a Service-Disabled Veteran-Owned Small Business (SDVOSB) and a Women-Owned Small Business (WOSB). Please try our product and leave your feedback. DIRECTIONS: Place on heat and stain resistant surface. Trim wick to 1/4' before lighting. Allow wax pool to reach perimeter then extinguish after and allow to cool. Discontinued use when 1/2' wax remains. WARNING: To prevent fire burn candle within sight. Keep out of reach of children and pets. Never put on or near any thing that can catch fire. This product was created using sustainable methods and materials. The components used to make this product are vegan. Candlecopia does not use animal products or products derived from animals. If you have any questions about this product by Candlecopia, contact us by completing and submitting the form below. If you are looking for a specif part number, please include it with your message.